Just to prove that we do what we say we’ll do here at SMileS – this picture is living proof that Jenna Harrison one of our telesales team was ‘donated’ to the Fairtrade cause last Friday (13th Aug) in Huddersfield. Jenna was tasked with visiting shops and offices in a section of Huddersfield Town Centre, promoting Fairtrade goods and asking for staff commitment to buying Fairtrade products for the business and for themselves. Jenna found that most people recognised the Fairtrade logo and also knew a little about the Fairtrade initiative; plus she managed to convert many to looking for Fairtrade products in shops and supermarkets, as well as talking about Fairtrade to friends and family. 35 names were added to a list of people who work in Huddersfield Town Centre who are now supporters of ‘making Huddersfield a Fairtrade town’. 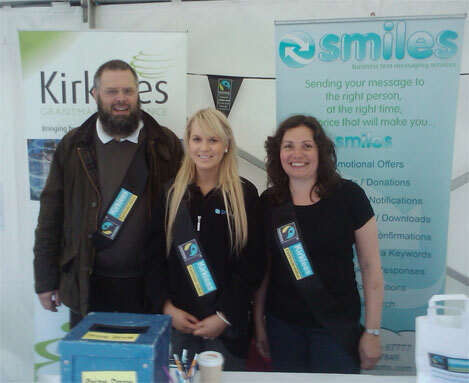 Posted on August 17, 2010, in SMileS Features/Articles and tagged Fair Trade, Kirklees, SMileS. Bookmark the permalink. Leave a comment.